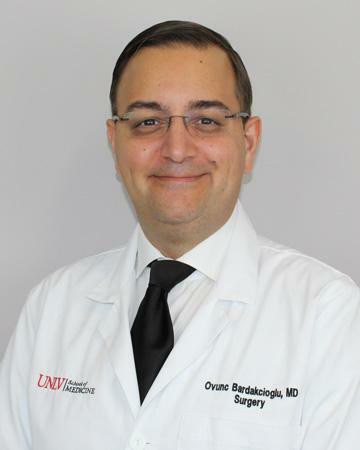 Dr. Ovunc Bardakcioglu, an associate professor of surgery at the UNLV School of Medicine, serves as chief of the Division of Colon and Rectal Surgery. Dr. Bardakcioglu was educated in Germany and chose to specialize in general surgery during his residency at Beth Israel Medical Center. He completed a fellowship in colon and rectal surgery at Cedars Sinai Medical Center, Los Angeles. 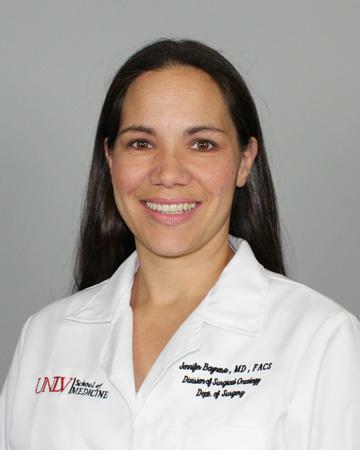 Dr. Jennifer Baynosa is an associate professor of breast oncology surgery at the UNLV School of Medicine. 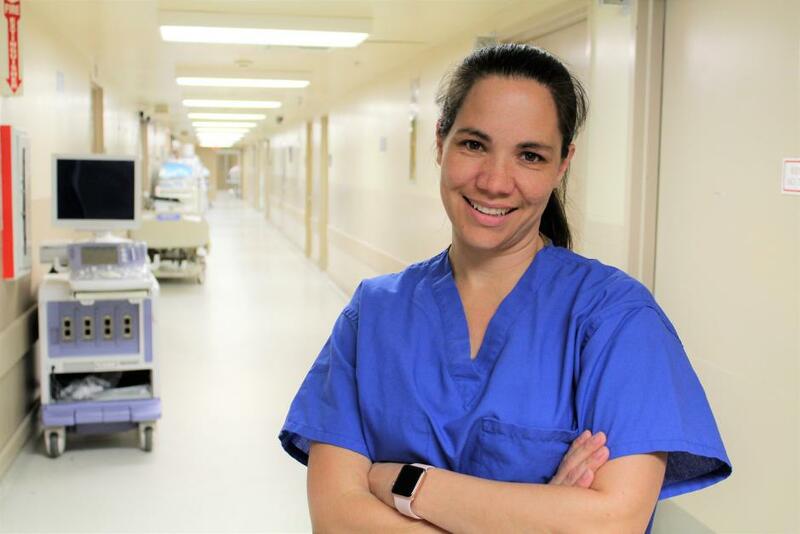 A graduate of the USC Keck School of Medicine, she completed her general surgery residence at the University of Nevada Reno School of Medicine. After residency, she completed a breast surgery fellowship at Stanford University. 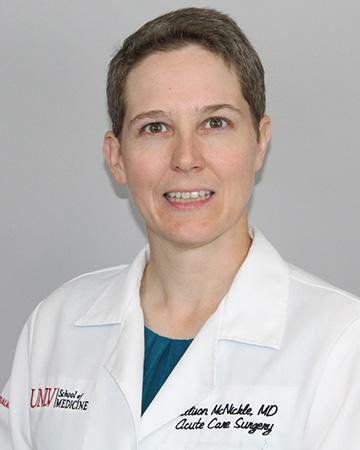 Currently the program director for the UNLV School of Medicine General Surgery Residency, her main research interest is breast cancer and how it metastasizes. 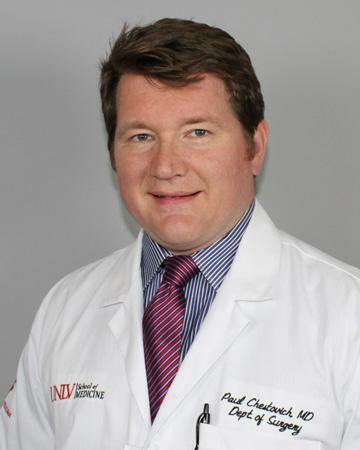 Dr. Paul Chestovich, an assistant professor in the UNLV School of Medicine Department of Surgery, graduated from Purdue University with degrees in chemical engineering and biochemistry prior to receiving his medical degree from Indiana University. He completed a general surgery residency at UCLA and an acute care surgery fellowship at the University of Nevada Reno School of Medicine. He has an active practice in trauma, critical care, burns, and acute care surgery, and is an active performer of clinical research. 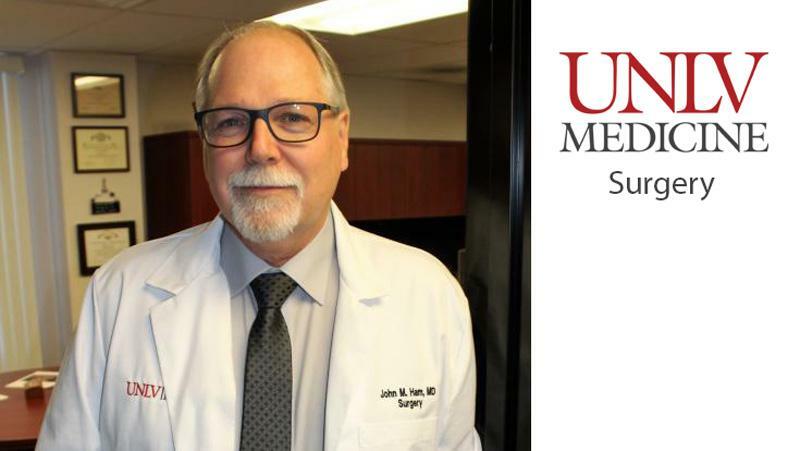 John Fildes, MD, FACS, FCCM, FPCS (Hon) is Professor and Inaugural Chair of the Department of Surgery at the new UNLV School of Medicine (UNLVSOM). He established the first AAST approved fellowship in Acute Care Surgery in the nation and he continues to function as its Program Director. 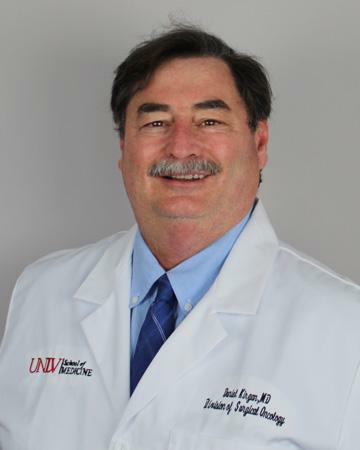 Dr. Daniel Kirgan, a professor in the UNLV School of Medicine Department of Surgery, is currently vice chair of the department, and chief of the Division of Surgical Oncology. 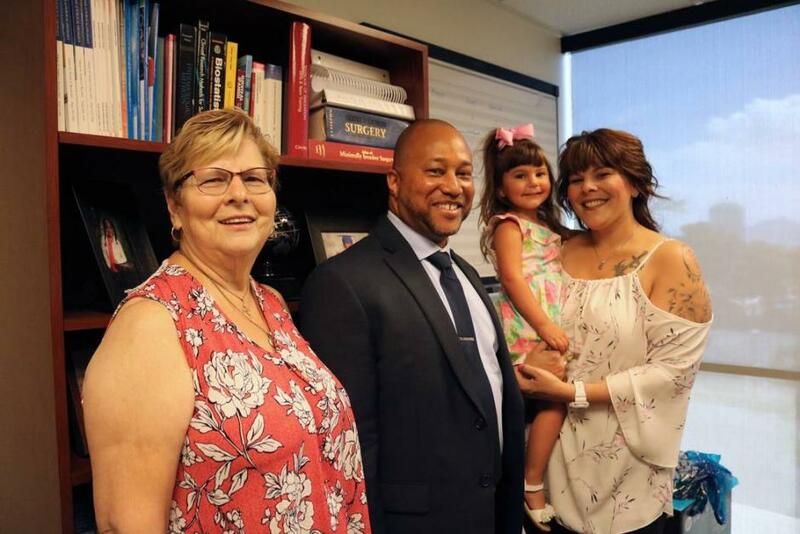 A graduate of the George Washington University School of Medicine, he completed his general surgical residency at the University of Nevada Reno School of Medicine. Following completion of his residency, Dr. Kirgan did a two-year surgical oncology fellowship at the John Wayne Cancer Institute in California. 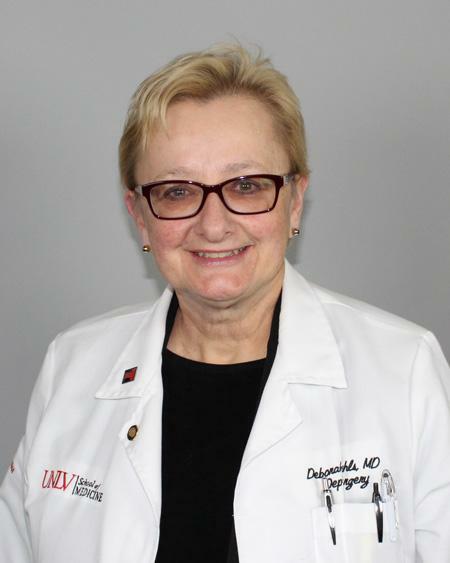 Dr. Deborah Kuhls, a professor of surgery and chief, section of critical care in UNLV School of Medicine’s Division of Acute Care Surgery, is a trauma surgeon who is board certified in general surgery and critical care. 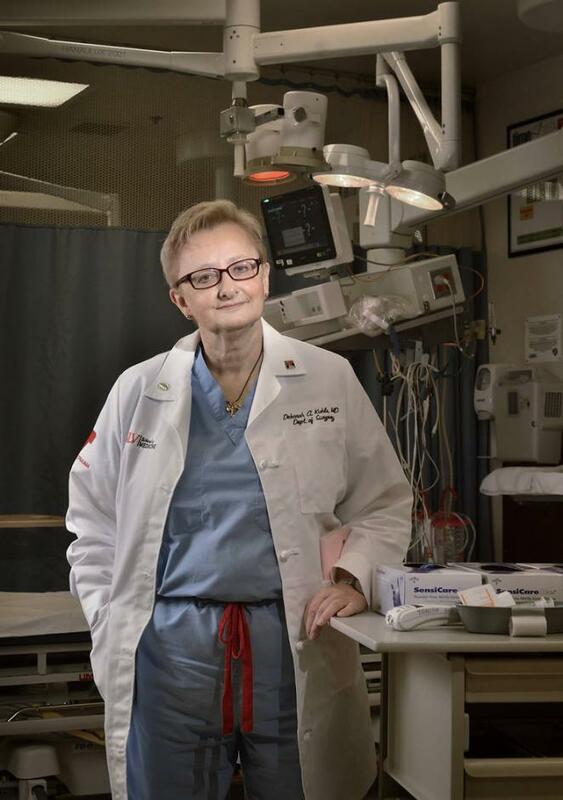 She also is the program director of the UNLV School of Medicine’s Surgical Critical Care Fellowship Program and medical director of University Medical Center’s Trauma Intensive Care Unit. She has a passion for teaching medical students, residents, and fellows. Dr. McNickle, an Assistant Professor at the UNLV School of Medicine Department of Surgery, is the Section Chief of Emergency General Surgery. 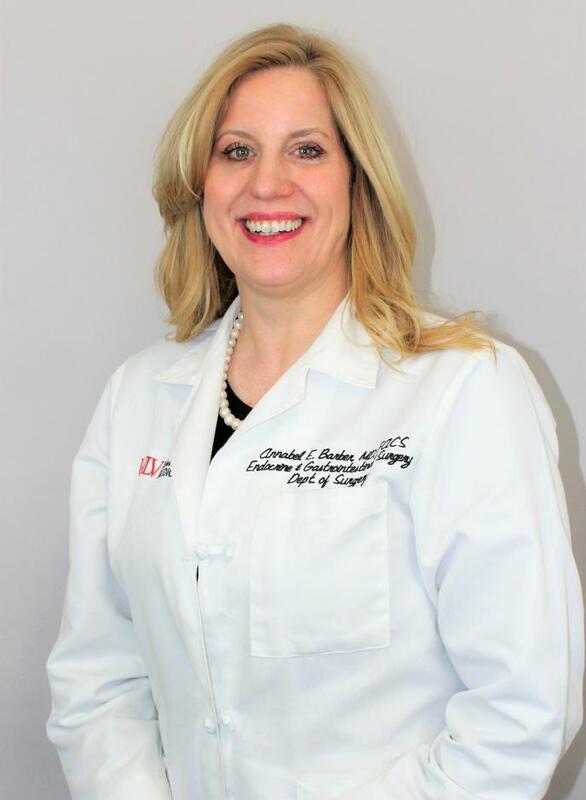 Dr. McNickle earned her medical degree from Rush Medical College and completed her General Surgery Residency at the University of Illinois-Chicago at Mount Sinai Hospital. She completed her Acute Care Surgery Fellowship at University of Nevada-Las Vegas. Dr. McNickle is Board-certified in general surgery and surgical critical care. 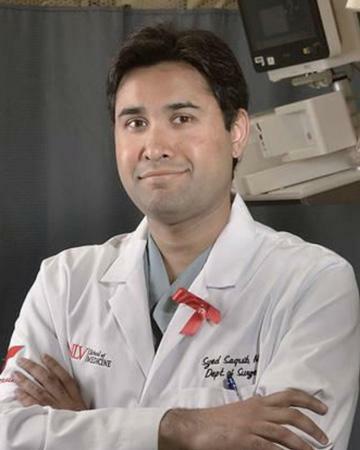 Dr. Syed F. Saquib, an assistant professor of trauma and critical care at the UNLV School of Medicine, works at University Medical Center in Las Vegas, primarily in trauma, burns and critical care. Heavily involved in UMC’s Lions Burns Care Center, he works closely with fellows, residents, and students in providing the best patient care possible. Dr. Gary Shen, an assistant deal of clinical education at the UNLV School of Medicine, is also an associate professor of surgery and associate program director for the general surgery residency program at the medical school. A graduate of the University of Rochester School of Medicine, he completed his general surgery residency training at the University of Arizona, and his transplant fellowship in Stanford University. 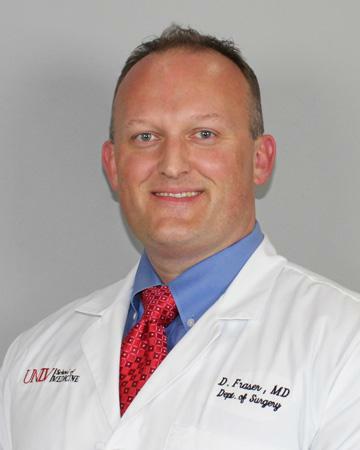 Dr. Snook, an associate professor with the UNLV School of Medicine Department of Surgery, is a trauma surgeon who is board certified in general surgery and surgical critical care. 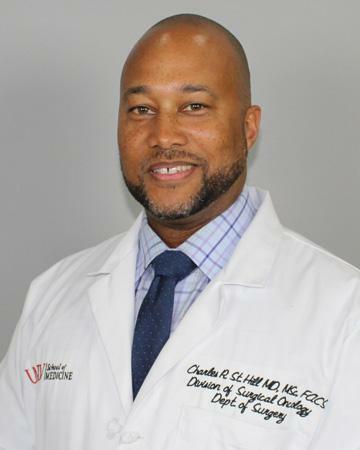 A graduate of the Boston University School of Medicine, he completed surgical residency with the US Air Force at Keesler Medical Center in Mississippi, and went on to do an acute care surgery fellowship at the University of Nevada Reno School of Medicine. Dr. Charles St. Hill, an assistant professor with the UNLV School of Medicine Department of Surgery, has pursued research in cancer surgery/clinical trials program development. 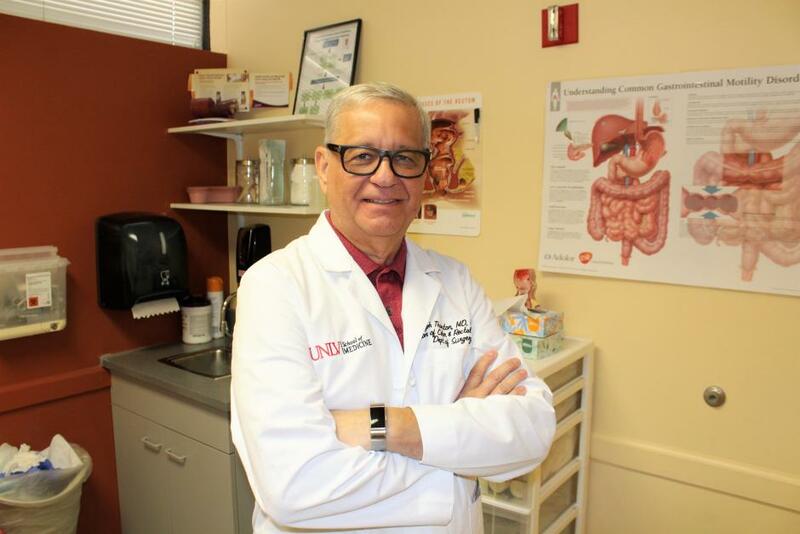 Dr. Joseph Thornton, an associate professor with the UNLV School of Medicine, has been a practicing colon and rectal surgeon in Las Vegas for more than 25 years. A graduate of Meharry Medical College in Nashville who later did a colon rectal surgery fellowship at Cook County Hospital in Chicago, Dr. Thornton is board certified in colon and rectal surgery and a fellow of the American College of Surgeons and the American Society of Colon and Rectal Surgeons. Dr. Wei Zhong Wang, a professor at the UNLV School of Medicine, is an orthopedic, hand and microvascular surgeon. Also an established research scientist with more than 25 years of experience – his research interest is ischemia reperfusion injury adipose stem cells — Dr. Wang completed clinical fellowships at Kleinert Institute for Hand and Microsurgery in Louisville, KY.
Dr. Joseph Thornton’s road to becoming a physician makes you realize yet again that where there’s a will, there’s a way. He grew up in a single parent household on the south side of Chicago, the son of an African American bartender who wanted the best for her son. His two aunts, both maids, also lived in the home. From her extended family what Dr. Jennifer Baynosa often heard as a child was that one day she would find a nice man, fall in love, get married, and have a family. Taking care of her children and her husband, preparing their meals and washing their clothes, was the future that would be hers. 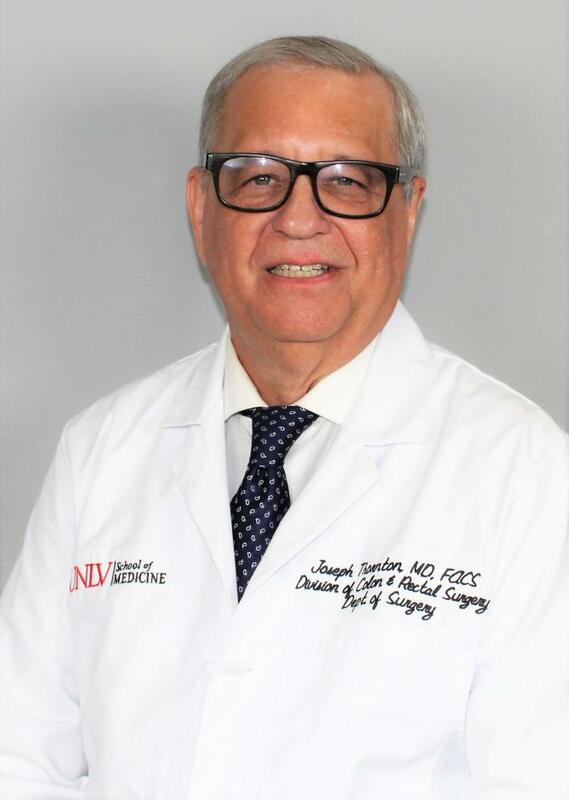 UNLV Medicine Dr. Ovunc Bardakcioglu, successfully performed a breakthrough surgical procedure using a new robotic device that required no incision through the skin, significantly shortened recovery time, and lessened the chances of infection. 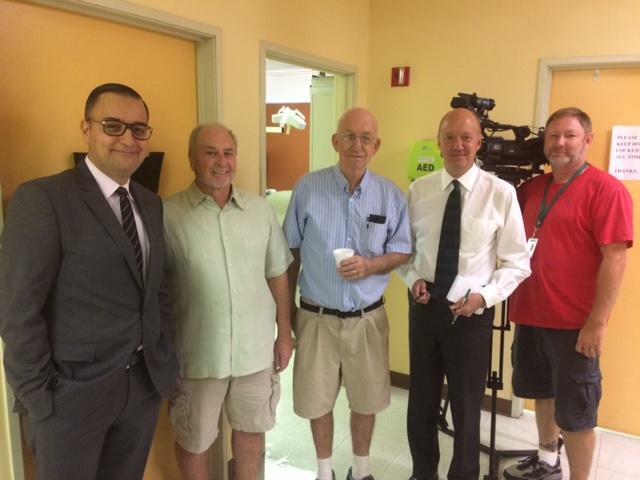 Dr. John Ham, professor of surgery at UNLV School of Medicine, leads UMC’s kidney transplantation program – which has one of the best 3-year survival rates in the nation. Katie Duda, 36, rolled her eyes at the memory, humorous now that her mother is nearing two years cancer-free. At the time, though, the thought of losing her mother was unbearably real. Mary Kay Duda says she’s one of the lucky unlucky ones. Unlucky in that the tumor growing inside her enveloped the head of her pancreas. Unlucky in that one Las Vegas surgeon declined to operate because the tumor was so large.